Home NHL Trade Deadline NHL Trade Deadline: San Jose Sharks — Buy A Little More? NHL Trade Deadline: San Jose Sharks — Buy A Little More? 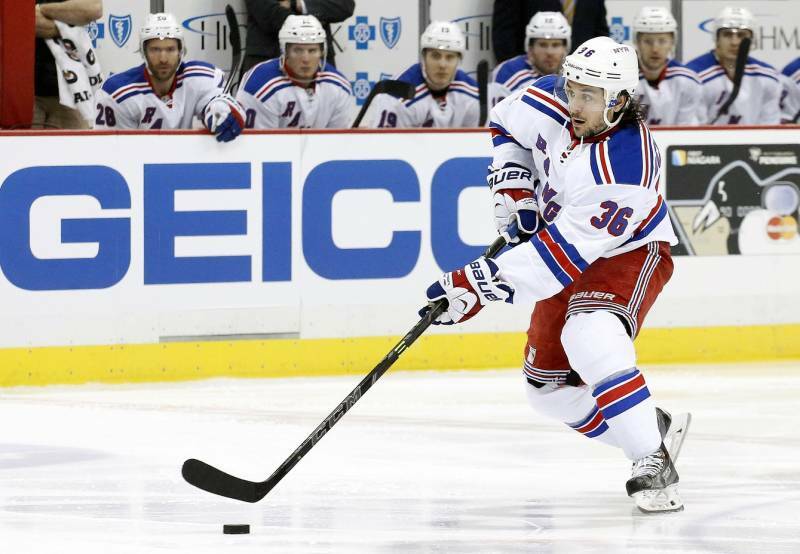 Mats Zuccarello may know soon enough whether he gets traded. The San Jose Sharks stand right around the top spot in the Western Conference. Furthermore, with several teams to around them in the standings, the Sharks are buying this trade deadline. Doug Wilson deals from a position of strength this trade deadline. They carry just enough cap space to make something happen. San Jose sees themselves as buyers. The Sharks are too close not to try and at least fine-tune their team some. So, what can they do? At some point, the general manager faces the specter of the salary cap. San Jose finds itself under the salary cap by $3.85 million. Now come the deadline, those dollars translate to approximately $5.33 million. Their SPC (Standard Player Contracts) stands at 45 currently. What do Wilson and the Sharks need? One thing is time. San Jose cannot extend Erik Karlsson until after the trade deadline. This likely means Doug Wilson can only take on players with expiring contracts (rentals). In the meantime, Wilson thinks about what he can acquire and how much will it cost. Some needs include a bottom-six winger, perhaps a veteran backup goaltender, and some penalty killing help. The problem is San Jose’s prospect pool is not the greatest and there is no first or fourth-round pick for the 2019 draft. Kevin Labanc and Joakim Ryan might be dangled to entice a better deal. Who else could come to San Jose? Let’s take a peek via Kevin Kurz of The Athletic. Mats Zuccarello — The forward comes at a price as far as cap hit ($4.5 million). His contract expires after the season. Also, Zuccarello is 31 and bouncing back after a slow start. He possesses nice relative metrics at +3.25% but hits the net just less than two times per game. The power-play numbers are pretty good (two goals, ten assists). Chances per game remain about the same as last year and in line career-wise. Zuccarello may still cost a team a first-round pick. Some suggest Kevin Hayes but that salary may be tough to stomach. Richard Panik — Panik could provide an uptick in secondary scoring. His relative possession compared to the team is +1.4% at even strength. His cap hit stands at $2.8 million. Panik tallied 10 goals and 22 points in 52 games for Arizona. His inconsistency hurt him this season more than others. However, his upside is more than most of what San Jose currently employs in its bottom-six. Marcus Johansson — Johansson presents as an intriguing case. Someone has to stay to help the youth in New Jersey, Right? Also, Johansson carries just the pro-rated amount of his $4.583 million cap hit. His 22 points in 43 games is a bit misleading given his chances generated and injuries. If he stays healthy, Johansson could make a nice acquisition for San Jose. His cost may not involve a first-round draft pick. Andre Burakovsky — Burakovsky looks out of Washington by the trade deadline. On a porous Washington squad, his metrics are +0.4% compared to team relatives. His ice time dipped to just 11 minutes — that is down almost three minutes from last season. The problem is he plays on the fourth line with no power-play time of consequence. He is just 24 and could be flipped easily for another draft pick or perhaps a player. Burakovsky makes $3 million so maybe someone goes back that earns close to that. Maybe salary retention and an added pick are enough to entice Washington? Marcus Kruger — Kruger screams risk but at a decent salary of $2.775 million. He scored just four goals and nine points in 49 games. However, the center is more known for his ability to kill penalties and play tough postseason minutes. Now, Kruger plays just less than 11 minutes a game. San Jose may give him a slightly bigger role. The price expects to be cheaper than most pieces. Maybe a mid or late-round pick could be enough to acquire Kruger. Again, there is no fourth-round pick. San Jose may need to involve a conditional pick as well. It is all about buying the right depth piece or pieces now. Again, the San Jose Sharks and Doug Wilson decide their future. What can they do? The next 13 days will tell the story. NHL Trade Deadline: Edmonton Oilers – Buyers, Sellers, or Both?